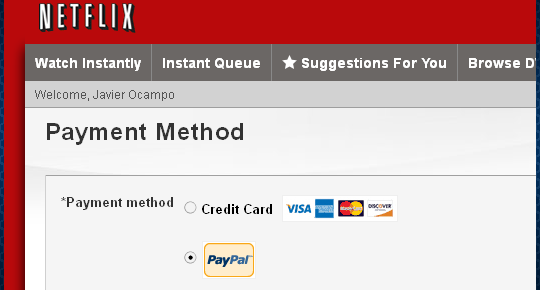 Ever wanted to try out Netflix but couldn't because you didn't have a credit card? well now you can! All you need is a PayPal account(with some funds I suppose) and you can try out their service for one month FREE. I was having problems with my account because for some reason the Green Dot was rejecting payments. pfft. But then I noticed I could connect the same card to my PayPal account then connect my PayPal to Netflix. I did the ol' switcherooo. So as you can see I owed $1.50 plus tax but then Green Dot was declining the charge so I did all the switching around and then they charged me with PayPal and no tax! had I switched on previous months when I pay a bunch of months in advanced I could have saved more money, as you can see in my previous payment I could have saved $1.75.